Different people choose different ways to pass on knowledge that helps other people. They may choose to encourage others as a parent, educator, coach, mentor, leader or in some other role. Some people also find that their ways of sharing information changes over the years. During the first part of their lives they may speak quickly and aim to impress others. Then something happens. Different people choose different ways to take these steps. One approach is for them to pause, ponder and then pass on knowledge that helps other people. Looking back, can you think of a situation when you went through some of these stages? You may have been helping a person to tackle a personal problem, answering a difficult question or helping people in some other way. What did you do to pause and buy time in the situation? What did you do to ponder and explore the possibilities? What did you do to then pass on knowledge in a way that helped the person or group of people? Describe a specific situation in the past when you chose to pause and ponder before passing on knowledge to people. Describe the specific things you did to go through these steps. Different people choose different ways to relax, re-centre and clear their minds before exploring a topic. They may use deep breathing, be quiet, go for a walk or employ another technique. Don Greene helps many creative artists to relax before giving a performance. Here is an introduction to that approach. You can discover more via the following link. Some people take a much longer time to pause. They may need to do their version of a detox before being able to be creative. Sometimes the transition takes a few hours; sometimes it can take much longer. Some people take this approach after finishing their full time paid career. They then take time to clarify their learning and pass on their experience to other people. E.F. Schumacher was somebody who took this step when writing Small Is Beautiful. Born in in Germany in 1911. He studied as a Rhodes Scholar at Oxford before settling in England in 1936. After the Second World War, he acted as an economic advisor to organisations helping to rebuild the German economy. Fritz, as he was known, then became Chief Economic Advisor to the British Coal Board, a post he held between 1950 and 1970. Despite playing a key role in shaping British industry, he began exploring alternative models. During the 1950s he acted as an economic advisor to countries in Asia. That good work plays a vital part in healthy human development. That developing local resources for local needs is the most rational way of economic life. That it is possible to empower local communities to employ appropriate technology they can use to shape their futures. 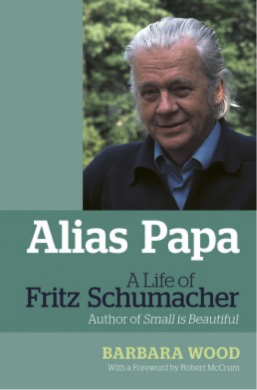 Fritz reached a moment of decision in his life in 1970, says Barbara Wood, in her book Alias Papa. He left full time work with the Coal Board to write the books that had been on his mind for years. Barbara explains that Fritz talked about how Konrad Adenauer and Winston Churchill both started new and successful lives at the age of sixty. So why shouldn’t he? This eventually led to him being asked to visit nations across the world. Schumacher’s Small is Beautiful is an appeal to the deep instinctive understanding of the common good that all people share. It is an appeal to our essential humanity. It deals with some of the most pressing concerns of people the world over, concerns which every generation must consider and answer. “What is Education? What is Knowledge? What is Wisdom? What is the source of true happiness and well-being? Call a thing immoral or ugly, soul-destroying or a degradation of man, a peril to the peace of the world or to the well-being of future generations: as long as you have not shown it to be ‘uneconomic’ you have not really questioned its right to exist, grow, and prosper. The aim of societies should be to enable people to obtain the maximum amount of well-being with the minimum amount of consumption. Imagine that you want to do creative work. You may have taken time to pause and refresh your mind. The next step will be to focus on the topic you want to explore. Writing on his blog A More Beautiful Question, Warren Berger highlights Albert Einstein’s views about asking questions. Below are some of the quotes he gives from Einstein. You can discover more via the following link. The important thing is not to stop questioning … Never lose a holy curiosity. If I had an hour to solve a problem and my life depended on the solution, I would spend the first 55 minutes determining the proper question to ask … for once I know the proper question, I could solve the problem in less than five minutes. Think about something carefully, especially before making a decision or reaching a conclusion. Sometimes it is useful to simply let your mind wander. On other occasions, however, it is important to ponder with purpose. If you want to share your knowledge in a way that helps other people, for example, you may want to explore some of the following questions. How do I want to encourage people? What do people need? What knowledge do I have that can help people to succeed? How can I pass on this knowledge to people? How can I make this knowledge attractive and accessible to people? Life is often a process of gathering experience, making sense of experience and passing on experience. Looking at your own life and work, how can you pass on knowledge that helps other people? One approach is to go through the steps of focusing on the What, Why, Who, How and When. Let’s explore these steps. What is the knowledge you can pass on? You may have expertise in gardening, counselling, building houses, managing crises, coding, leading teams, first aid, solving particular problems or whatever. Sometimes it can be useful to brainstorm all the topics you may be able to teach about. You can then settle on, for example, three themes and describe these in ‘How to …’ terms. Who would you like to reach with the knowledge? Would they be young people, those with learning difficulties, budding entrepreneurs, athletes, leaders, scientists, social entrepreneurs, therapists or other people? What would be the characteristics of these people? Would they be motivated and wanting to learn? What other qualities would you like to see in your ideal students? When do you want to share the ideas with people? What would be your preferred setting? Would you like to run a seminar, produce a blog, run a coaching session or whatever? When do you want to make this happen? Maria Popova looked beyond her own experience and developed another way to share knowledge with people. She created the website Brain Pickings. This offers a treasury of wisdom created by individuals, writers, artists, scientists and many others who explore the richness of life. You can discover more via the following link. The video below was filmed when Maria was presenting at the gathering called Creative Mornings. In it she describes some of the things she has learned when compiling the website. Here is a link to that organisation. There are many ways to help other people. 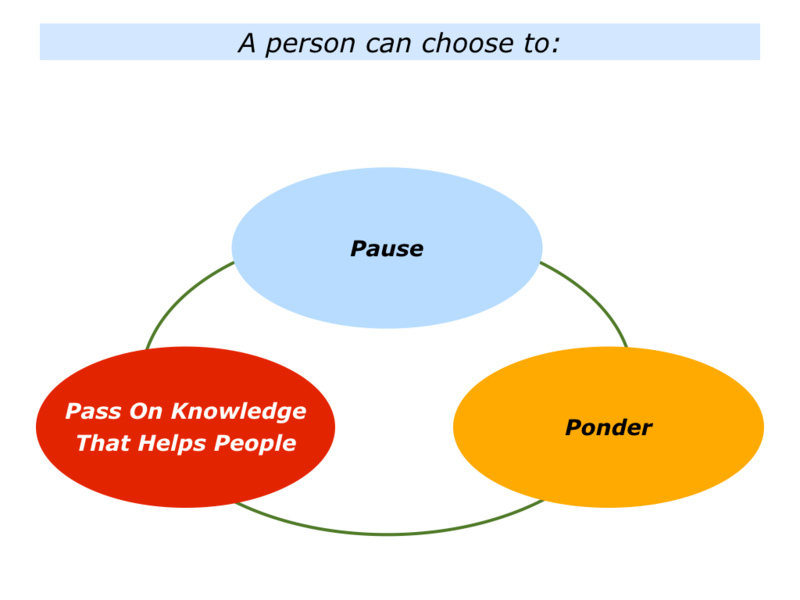 One approach is to pause, ponder and then pass on your knowledge. Looking to the future, can you think of a situation where you would like to take these steps? If you wish, try tackling the exercise on this theme. This invites you to do the following things. Describe a specific situation in the future when you may choose to pause and ponder before passing on knowledge to people. Describe the specific things you can do to go through these steps.